1. Welcome and Thank You For taking the Time Help Us. We know that you have lots of choices when it coming to bringing in a Professional to look after your pets and we want to be the Professionals you choose. We recently looked after your pets in your absence. Please Help us serve you and your "kids" better. Tell us how we did or are doing. We'd love to hear from you. Your feedback is vital and will help us to provid the best possible experience for you and your pets. * 3. Please select the category that includes your age. * 4. What best describes your marital status? * 5. What best describes your employment status? * 6. What best describes your level of education. * 7. Which of the following ranges includes your total yearly household income before taxes? * 8. How many dogs are in your household? * 9. How many cats in your household? * 10. Do you have other types of pets in your home? * 11. 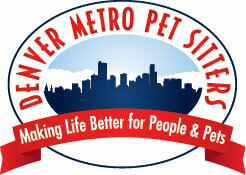 Are you a current client or past client of Denver Metro Pet Sitters? * 12. What best describes your role with your pets? I do not make any of the decisions regarding the pets health and welfare. I make some of or am involved in decisions regarding the pets health and welfare. * 13. How did you hear about Denver Metro Pet Sitters?